Opti-Clean is a revolutionary product that is specially formulated to clean and protect all automotive surfaces safely and efficiently without using any water. A combination of substantive polymers and cleaners safely removes dirt and grime and leaves a glossy protective finish on all automotive surfaces. 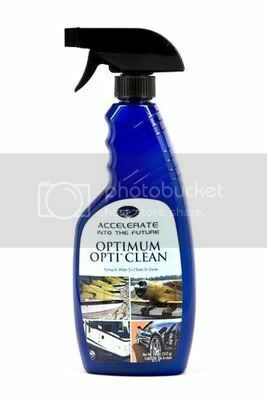 Optimum Opti-Clean is based on the same natural polymers used in Optimum No Rinse and is safe for use on all automotive surfaces, as well as being safe for the consumer and the environment. Spray liberally on painted surfaces and wipe clean with a plush microfiber towel. Fold and use a new section of the towel as needed. For glass and interior surfaces, apply one or two sprays and wipe off with a clean plush microfiber towel. For lower panels and wheels, spray liberally and let it soak for a few seconds and then wipe off. When there is heavy dirt build up, we recommend the use of Optimum No Rinse. Optimum Power Clean is an all purpose cleaner that safely cleans your vehicle’s dirtiest surfaces. 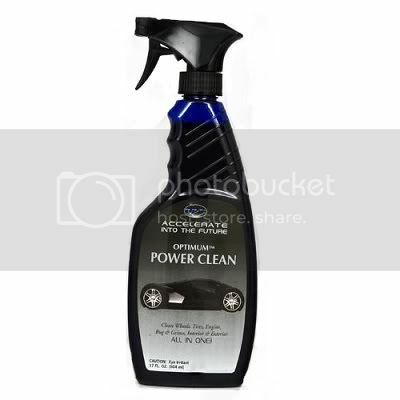 Remove bugs, brake dust, and oily grime when using Power Clean full strength. Dilute it to clean leather, vinyl, and plastics. Optimum Power Clean is an environmentally friendly, safe cleaner that will leave your vehicle spotless! Optimum Power Clean packs a powerful punch, yet it’s gentle when it needs to be. Clean everything from the engine and wheels to the leather and dashboard with one product! Optimum Power Clean can even be used on the paint to dissolve bugs and stubborn contaminants. For many jobs, you can simply spray it on and wipe it off. Use full strength, Optimum Power Clean cleans and degreases the engine compartment, cleans tires, wheels, and wheel wells. This sophisticated formula dissolves bugs and powers through brake dust and oil to clean your vehicle’s dirtiest parts. Dilute Power Clean to safely clean leather, vinyl, paint, and plastics. Remove old dash dressings and tough residues from interior panels. Wipe away spills and spots from leather seats. Special polymers and emulsifiers break down contaminants with minimal agitation.